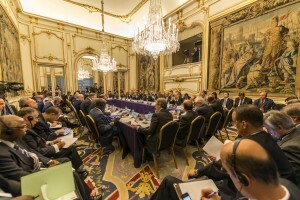 The Madrid Conference. Photo: Spanish Foreign Ministry. The Madrid Conference on Libya today opened in a mood of pessimism as Spanish Foreign Minister Jose Manuel Garcia-Margallo warned that the country could end up in a civil war similar to that in Syria. Such a disaster and the prospect of extremists taking over the country could still be prevented he said, but there were no concrete proposals at the meeting apart from yet more calls for dialogue. There was, however, agreement that outside military intervention was not an option. Bernardino Leon, the newly appointed special representative of the UN Secretary General for Libya, called for an immediate ceasefire.